Two and a Half Men "People Who Love Peepholes" (S09E02): Walden has asked Berta to stay on as the housekeeper, and now she'll be a live-in. We hear her thoughts as they have a conversation, and they're hilarious. [she finds Walden totally hott, as pretty much every woman we've seen him encounter does. I don't see it, but maybe the long hair and scruffy face just don't do it for me. What do you think? 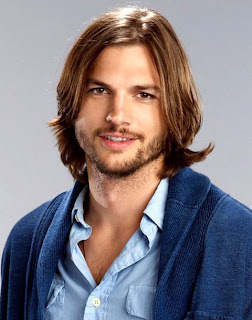 I included an image to the right in case you haven't seen the show and don't know what "look" Ashton Kutcher is playing...] Alan leaves his keys and garage door openers and hugs Berta good-bye. [Walden didn't get Alan's "People who love Peepholes" joke! I thought it was hilarious!! Actually, I'm laughing again, even! But, Walden is just SO goofy. He makes me laugh. I love it. Oh and the fact that Alan forgot Jake was good, too].